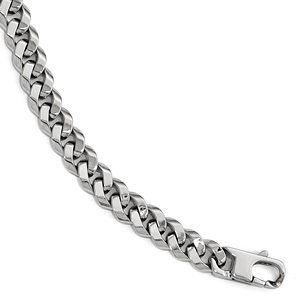 Few pieces can add a touch of class quite like white gold bracelets for men. They�re always in good taste and, thanks to the fine metal from which they�re crafted, they never go out of style. Whether you prefer a slender, subtle look or a more daring wide style, Apples of Gold has a white gold bracelet in a width and style that�s just right for you. Read more. This collection of white gold bracelets for men contains several timeless styles that have proven their ability to add class year after year. 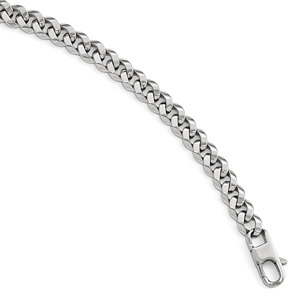 For instance, Figaro chain bracelets offer a taste of upscale Italian design as three round links alternate with one oblong one. Named after one of the operas of Rossini, this type of chain is a perpetually pulled-together accent. 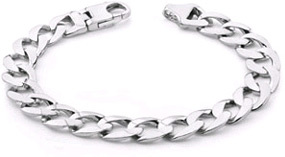 Like Figaro chains, white gold curb chain bracelets for men are also timelessly classy pieces. This style of chain was originally used in horses� bridles because its links sit flat against one another and are less likely than other types to pinch a horse�s skin. Although curb chains are usually chosen for their sophisticated good looks and versatility, their skin-friendly design remains, making them good-looking and practical choices for a wide range of occasions. 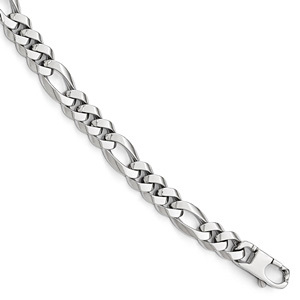 White gold mariner chain bracelets are another perpetually good-looking style. These nautically-inspired bracelets call to mind the chains that tether an anchor to a ship: each shining oval-shaped link is bisected by a bar to form a masculine, sturdy look that�s always in good taste. In addition to these three classic styles, Apples of Gold�s collection of white gold bracelets for men includes a number of less traditional looks that make eye-catching statements. From distinctly modern pieces to those destined to become tomorrow�s basics, these are pieces with serious style. Each of these bracelets, regardless of style, is crafted to last for generations. That means that they�ll be able to take any outfit up a notch for decades and decades to come, needing little more than an occasional cleaning to keep them in stellar shape. These aren�t merely gold plated pieces�they�re crafted from solid 14K white gold and are designed to retain their good looks for the long haul. Any of these white gold bracelets for men would make an excellent gift for any special guy in your life or a great addition to your own collection. No matter which one you choose, you�ll choose a piece with class.